As a child I remember my mom eating tuna fish straight from the can, drenched in balsamic vinegar. How odd, right? Well for some reason that flavor combination has stuck with me and I created a dressing using traditional mayo and the vinegar. It’s a simple and easy recipe that you can’t mess up. 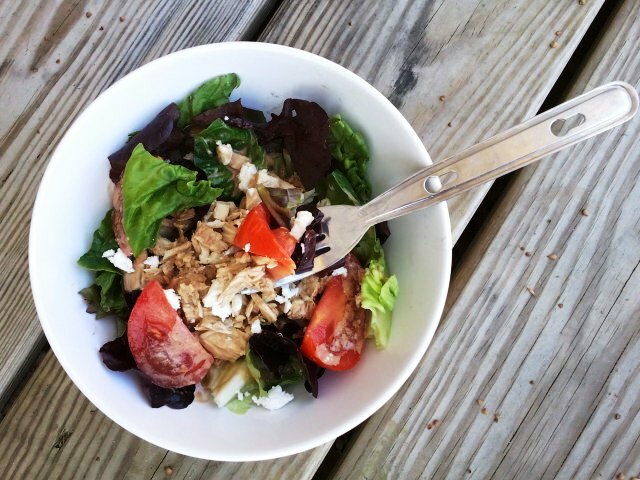 You may be pleasantly surprised at how well the tuna and balsamic vinegar merry together. My favorite part about this salad is it’s fast and convenient. Who doesn’t have a can of tuna in their pantry right now?? Feel free to use this dressing on any type of salad. I eat a lot of salads, so I am always looking for new ways to dress them up. Combine ingredients and toss in creamy balsamic dressing. It IS SOOOO good. Michelle served it to me on salad that had grilled chicken on it as well. Oh goodness. I’m gonna go make some now. It seems to me that this would be just as good on canned wild-caught salmon, no? I always have some of that in the cupboard so that’s going to be what I try it with. Absolutely, I have used it on leftover fish including salmon, it’s actually quite good with chicken too!